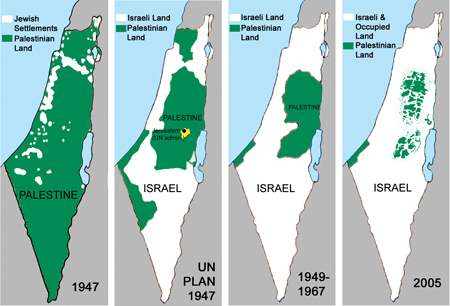 Countering the 'shrinking Palestine Maps' lie. Countering the ‘shrinking Palestine Maps’ lie. A timely piece posted with the permission of Edgar Davidson from the Blog of the same name. Please check it out. I read it a few years back when it was first published and is recommended as an excellent advocacy piece. One of the most pernicious and common lies propagated by anti-Israeli activists is the so-called ‘shrinking maps’ of Palestine (see bottom of this article). As with most anti-Israel propaganda (like “Israelis are baby-killers” whereas in fact Israel does everything to avoid any civilian casualties while Palestinians specifically target young children; and “Israel is an apartheid state” whereas Israel is the only country in the Middle East to provide full rights for all religious groups while the Palestinian Authority allows no Jews at all) the claims are a perfect inversion of reality. 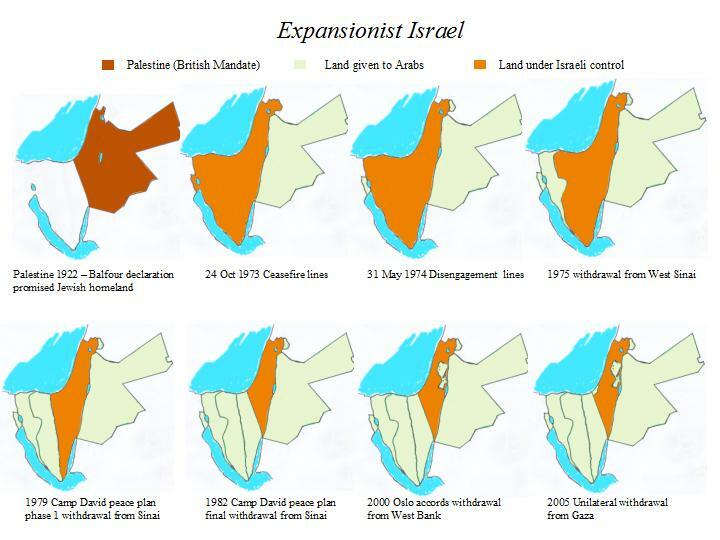 These maps are based on the completely false premise that, prior to 1947 there was an Arab state of Palestine. In fact the Palestine that was promised to the Jews as part of the Balfour declaration was the British mandate territory that includes what later become the state of Jordan (my map above top left). There was not – and never has been – an Arab state of Palestine even though, between 1948 and 1967 there was no ‘occupied territories’ of the West Bank or Gaza since these areas were then under the full control of Jordan and Egypt respectively. The Palestinian Arabs living there during that period never called for an independent state of their own. Only the Jews of Palestine considered themselves Palestinian before 1948. The Arabs – most of whom had come to Palestine from Egypt and Syria because of the economic opportunities opened up by the Jews – considered themselves to be Syrian. Despite the fact that 80% of mandate Palestine (not shown on the maps that lie) had already been granted to the Arabs exclusively to become the new state of Jordan, the Jews of Palestine accepted the UN partition plan of 1947. The surrounding Arab states did not accept it and launched a war of annihilation against the Jews (during and after which some 1 million Jews from Arab countries were forced to leave – most of them came to Israel). 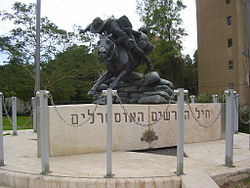 The result of the war that was intended to murder every single Jew in Palestine was that the invading Arab armies were defeated and the Jews controlled slightly more territory overall than was part of the 1947 plan; however, they also lost some territory such as the Jewish quarter of East Jerusalem (including Judaism’s holiest sites such as the Wailing Wall) and Gush Etzion that even the 1947 plan had not considered to be under Arab control. The UN accepted the 1949 armistice line as defining the borders of Israel, while calling for East Jerusalem (now under Jordanian occupation) to be ‘internationalised’. The Arab states refused to recognise the State of Israel and have continued to this day to try to destroy it. The Jordanians who occupied East Jerusalem in 1948 expelled every Jew and destroyed every synagogue in the old city. Not a single Jew was allowed to enter Judaism’s holiest sites until 1967 when, after the Egyptians, Jordanians and Syrians launched another attempted war of annihilation, Israel regained control over the old city and other areas. Israel offered to withdraw from all the newly gained territories in return for peace but the offer was rejected by the Arab countries. With the exception of Jewish East Jerusalem Israel has essentially made the same offer over and again ever since but it has always been rejected. Despite this, Israel has returned the whole of Gaza and most of the West Bank to Palestinian control. But the Arabs continue to demand the destruction of all of Israel.